It feels, pleasant and good, it is a way to show care, love and help is Good Touch. Touches that make you uncomfortable and you feel unpleasant and you want to stop it there and then, is Bad Touch. Sensitizing children about various issues and about good touch bad touch, makes them emotionally strong and helps them to grow normally. Come; let’s join hands to make this world a better and safer place for our young generation. 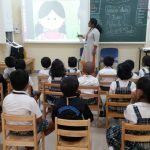 In order to educate our young ones, Vydehi School of Excellence Pre-primary Sections conducted a workshop on Good Touch & Bad Touch on 13th March 2018.